Home » What is Domestic Violence? Domestic violence is a pattern of violence, abuse, or intimidation used to control or maintain power over a partner who is or has been in an intimate relationship. Fundamentally, domestic violence is about power and control. There are various forms of domestic violence, including physical, emotional, psychological, sexual, social, and financial abuse. Abusers often use more than one form of abuse to invoke fear or coerce a partner into behaving in ways they don’t want to. 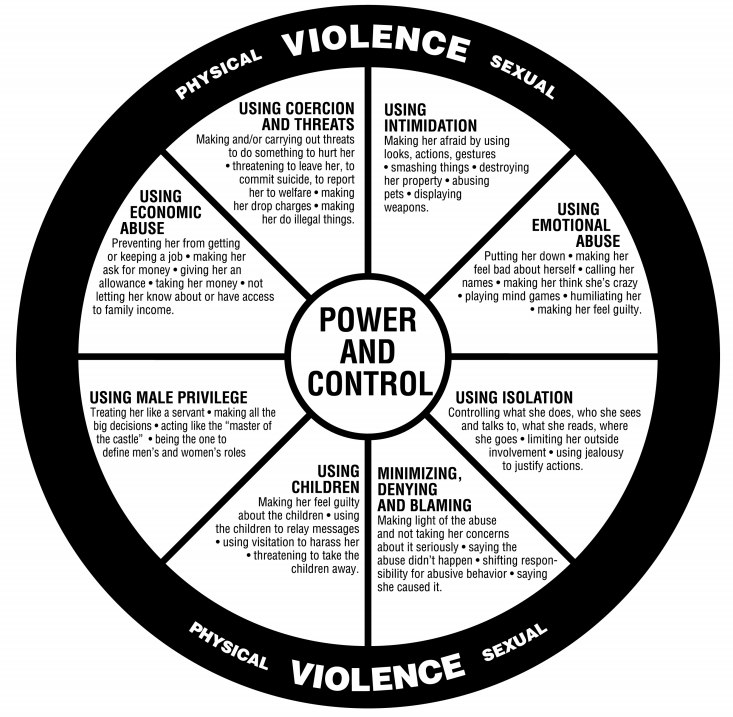 The power and control wheel, developed by the Domestic Abuse Intervention Programs in Duluth, Minnesota, shows how domestic violence is a behavioural pattern — and how abusers may use different tactics to establish power and control. Domestic violence often happens in cycles. The cycle of abuse happens when the abuser threatens violence, abuses the partner, apologises and promises to change, before starting the cycle again. 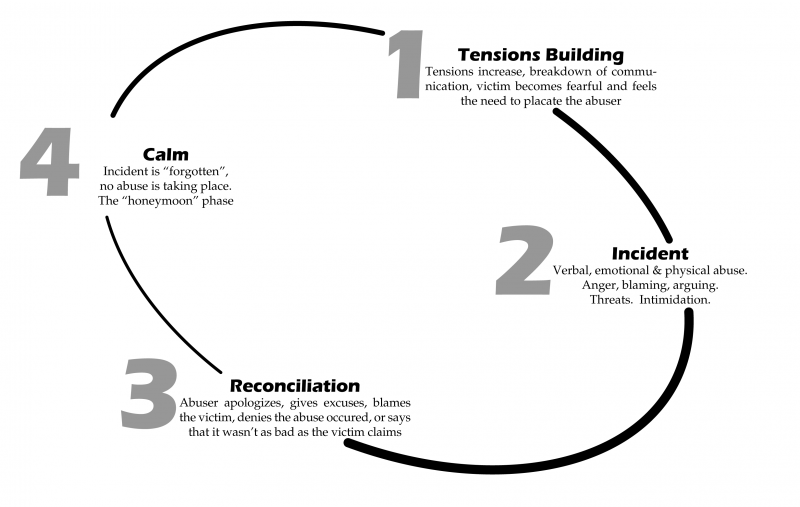 As the cycle shows, abusers may not be actively violent all the time; the mix of both violent and “honeymoon” phases is what makes abuse confusing — and hard to break away from. It is a tactic for abusers to maintain power and control. It is crucial that you recognise the signs of domestic violence and break the cycle. There are a lot of myths about domestic violence in our society. Let’s dispel some of the common myths here. Myth: Domestic violence is only a momentary loss of temper. Fact: To view domestic violence as only something momentary is to minimise the issue. Domestic violence is about systematic control and abuse of power. Myth: Domestic violence happens only in poor families. Fact: Domestic violence can happen to anyone regardless of socioeconomic background. Myth: Domestic violence is only a slap or a punch once in a while and isn’t serious. Fact: Domestic violence is repetitive and habitual behaviour which can take the form of physical, psychological, social, sexual or financial abuse. Domestic violence causes serious suffering — not only physical injuries but also psychological trauma and distress. Myth: Heads of households have a right to control women. Fact: Heads of households have no right to control or to limit the freedom of women. Domestic violence is a grave violation of fundamental human rights. Myth: Survivors provoke their partners’ abuse and deserve to be hit. Fact: No one deserves to be hit. There are never any excuses for abusing a partner. Fact: The belief that domestic violence should be addressed within the family hinders survivors from accessing justice. Domestic violence is a crime under the Domestic Violence Act and must be addressed accordingly. Fact: Because of the controlling nature of abusive relationships, survivors often find themselves trapped in the abusive situation. Feelings of shame and the lack of support also hinder survivors from walking away. Fact: Factors such as economic dependence and the fear of escalating violence are barriers that hinder survivors from leaving. This is why it is so important to have support systems for survivors. Fact: Domestic violence involves maintaining power and control over a partner. Perpetrators often promise to change, especially after a violent outburst, as a tactic to control survivors and to prevent them from leaving. However, in many cases, the abuse is repetitive. Fact: Domestic violence may appear to be absent or hidden because of social norms that prevent domestic violence from being discussed openly. However, domestic violence can happen in any community, even if you do not see it happening. Fact: Domestic violence is about power and control. In relationships, the power imbalance between partners takes the form of systematic control and devaluing of women. Domestic violence is not simply the result of impulsive anger; it is often systematic and deliberate. And there is no excuse for such behaviour.